Following a spectacular ice-skating marathon on the Huvskol Lake in Mongolia, the Gobi Marathon and the ice-skating event on the Yellow River in China, FIT Adventure Sports Travels organises again a fantastic major sports event: Mountain Bike Tours between the Yellow River, along and on the Great Chinese Wall in Shanxi Province, along the border between China and Mongolia. Five days (5) of mountain biking through marvelous landscape scenery will bring you back to historical times. Terraced farm fields where farmers still work with sickles, scythes and hand ploughs and live in cave dwellings. While remnants of the Great Chinese Wall welcome you, these provide excellent tracks to enjoy the mountain biking here! The 6000 km Great Chinese Wall was built to stop the wild nomads coming from the north. It prooved to be in vain: during the 13th century the legendary Dzjengis Khan broke through the wall land, settled there and layed down the foundation for the world’s largest empire ever! The Yellow River Huang Pu is more than 500 m wide and surrounded by mountains of which the slopes carry remnants of this Great Chinese Wall, the longest construction work in the history of the world. The event will be organised with a minimum number of 10 participants. In case the event has to be cancelled, you will be informed not later than 4 weeks before the scheduled dates. When the minimum number of participants is registered, you will be informed directly on the exact dates the event will take place, including details regarding the travels involved. Making a reservation is no booking (yet)! Transfer from Beijing International Airport to the hotel in the ancient city, where you spend your own leisure time. An option is offered (not included in the price) for a first biking tour through The Hutongs and The Forbidden City. Today’s program offers private leisure time to get to know Beijing City. An alternative option for a trip to The Great Chinese Wall will be offered, as well as a marvelous show of acrobatics (both are not included in the price that is mentioned). In the early evening we will be transferred to the railway station for a nighttrain ride tot he city of Suozhou. Upon early morning arrival in Suozhou, a 5 hour bus transfer will take us tot he Yellow River. In the afternoon technical preparation of the mountain bikes is scheduled, as well as ample opportunity to undertake first mountain bike trips in the direct vicinity. Some characteristics of today’s mountain bike tour: differences in altitude, between 1030 and 1570 m; technical level, 2; level of endurance, 1. Following a breakfast at the dwellings of local farmers, you start the first leg of this tour with a severe 2,8 km climb, reaching an altitude of 1221m. Here you are offered a splendid view on the Yellow River and its surrounding terraced landscape. The first 8 km lead us over asphalt roads and on to unpaved paths towards Yellow River Castle, completely built from yellow clay stones originally coming from Yellow River sediments. The cave dwellings nearby the castle still harbour farmer families and provide coolness in the summer and warmth in the winter. While passing by these farmers working their fields,we will arrive for lunch at Mount Chaoduoshan Castle. Following lunch the mountain bike tour takes us to our first night stay nearby Shuiquan Great Wall Castle, where we will camp overnight. Some characteristics of today’s mountain bike tour: differences in altitude, between 1300 and 1800 m; technical level, 2; level of endurance, 1. After today’s breakfast the asphalt road filled with every day local traffic, leads us on to an unpaved path, resulting in a serious 5,8 km climb towrads an altitude of 1487 m. The tour takes us along the well preserved Great Chinese Wall to Dept Mountain, surrounded by an hardly touched natural landscape. We overnight in tents nearby the farmer’s cave dwellings. Some characteristics of today’s mountain bike tour: differences in altitude, between 1500 and 1710 m; technical level, 2-3; level of endurance, 1-2. 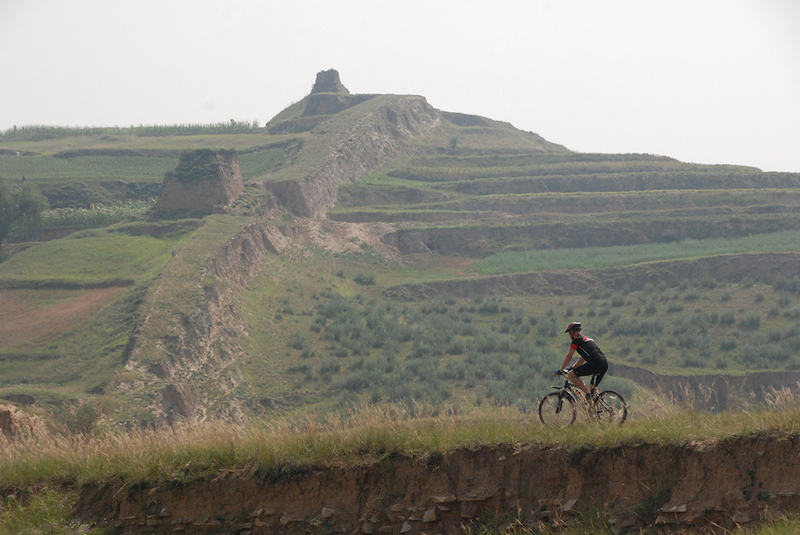 Following breakfast today’s program ‘invites’ us to continue our mountain bike tour along the Great Chinese Wall. After a 8 km climb it takes us to an altitude of 1620 m from where a descent leads us to a valley with splendid views on this impressive construction work, that runs like a snake through hilly pastures and dense forests. After lunch and the subsequent afternoon program we enjoy dinner and overnight again in our tents close tot he cave dwellings. Some characteristics of today’s mountain bike tour: differences in altitude, between 1450 and 1695 m; technical level, 2-3; level of endurance, 2-3. Today’s mountain bike tracks will take us through mainly flat grounds, where we pass by a lake that gives way to the Great Chinese Wall. We will enjoy lunch along the lake’s shores, after which a 18 km tour over the well preserved Wall and an additional climb brings us to the mountain top at Shakukou Pass (The Pass of the Killing Tiger). Today we stay overnight in a small local hotel nearby this pass. Some characteristics of today’s mountain bike tour: differences in altitude, between 1164 and 1884 m; technical level, 2-3; level of endurance, 2-3. In the beginning of today’s program wide paths along fields of grain lead us through a series of small villages where time has stood still, as it seems. We bike along the Great Chinese Wall tot he top of Beacon Tower, resulting in a spectacular view over the surrounding landscape. Following lunch we transfer together with our bikes to the hotel in Datong City. National flight back via Hohot to Beijing. International flight back to The Netherlands, arriving there the same day. Dutch travel supporting guides – € 50,= per person. Either you arrange your own visa or ask FIT Adventure Sports Travels to do this for you, by indicating so in your final reservation. To apply for a visa you need a passport, valid for at least 6 months following departure to China. Following reservation or booking for the trip FIT Adventure Sports Travels invites you to attend a pre-travel participants meeting. Here you will receive detailed information on background, program and various apects about this trip. Also you will have ample opportunity to ask questions and gather additional documentation. FIT Adventure Sports Travels offers you the opportunity to turn your endurance sport into an adventure. We organise sports travels in areas of natural beauty, almost untouched by (mass) tourism and in doing so, offer you the unknown and unexpected. You will experience basic outdoor living in foreign countries, combined with local standards of modern life circumstances. We closely work together with local people and create employment. Thus avoiding, that people leave the country side for a life in the city and doing so, preventing that old traditions and cultures get lost.